Richard Rashke is a lecturer and author of non-fiction books including The Killing of Karen Silkwood, Escape from Sobibor, and Stormy Genius: The Life of Aviation’s Maverick Bill Lear. His works have been translated into eleven languages and have been the subject of movies for screen and television. He is also an alto sax player and composer. His latest composition, Crane Wife, a family musical based on a Japanese folktale, was performed at the Kennedy Center, and a new play, Dear Esther, based on a Sobibor prisoner opened this year. Richard Rashke is also my uncle. 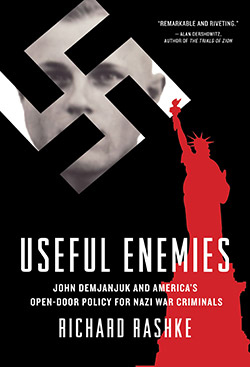 My uncle’s latest book, Useful Enemies: John Demjanjuk and America’s Open Door Policy for Nazi War Criminals, is an exposé of the American government’s campaign since 1940 to keep European Jews out of the U.S. and knowingly allow dozens of Nazi war criminals in. My uncle will be in Madison, Wisconsin reading segments from his book and signing books on Thursday, May 23, 2013. The event starts at 7 pm at the west side Barnes and Noble bookstore and is open to the public. I encourage anyone interested in history or in just reading good books to attend. For more information about Richard Rashke and this event visit http://www.richardrashke.com or http://store-locator.barnesandnoble.com/event/4380613. Copies of the book are available at Barnes and Noble or online at http://www.barnesandnoble.com.